This is part one of John Riley’s beginners’ guide to photography. Here he shows us the best way to organise our digital image files. Initial dialog after SD card inserted in reader can be closed. There’s a good deal of complex information available on the methods of handling your image files, but, for many of us, a simpler approach may be all that’s needed. This article offers a simple method for dealing with the commonly required adjustments to a digital image. This method is just one of many ways to approach digital photography. The screengrabs are made with Photoshop 7 which is fairly generic in its appearance. It should be possible to relate to other imaging programs which offer similar features. As beginners I would suggest starting with JPEG capture. Use the best quality level and the lowest compression, such as the premium setting in the K20D, and quality A3 prints will not be a problem. I leave my camera set on the default sRGB colour space and this ensures bright and universally useable images. You should only use the more advanced AdobeRGB colour space when you know a little more about converting to appropriate viewing media. Remember, this is all about the simple approach. mastered your camera to some degree. The image folder is dragged and dropped into the prepared folder in My Documents. You can transfer photos directly from your camera with a suitable cable, but by far the most efficient way to transfer images to the computer is a card reader. Probably built in and if not then available as a very low cost USB add-on. Please note that SDHC cards need a suitable SDHC card reader and older built-in units may not work. 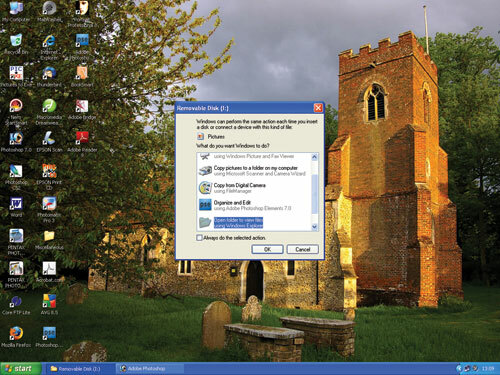 When the card is inserted a dialog box may appear like the one shown in the illustration above. This enables downloading but I close (cancel) this box and use a different method. Open My Documents and Make a New Folder. I number these in order and give then a short ID name. Now open My Computer and double click the card drive (The I Drive on my PC), double click DCIM and then you have the folder ready to copy across. 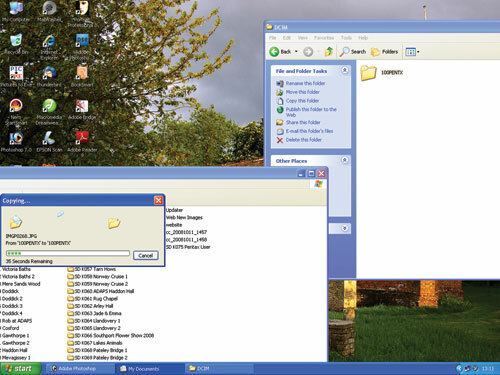 Just click, hold and drag the 100PNTX folder into your image folder (see illustration bottom left) and the images will be copied to your hard drive. These are my “negatives” and are always kept intact and unchanged. When I have made a backup copy on CD then the SD card is formatted and ready for re-use. This has described a simple workflow without the need for purchasing special software to organise your images. You have the files in order and a brief description and date could also be added to the folder name if desired. In this way, most originals can be easily found as required. Part Two will describe how to set up your image editing workspace and how to find the images that you want to work on.